All known references to Samuel Gentry, son of the immigrant Nicholas Gentry, are reviewed in detail, and arguments are advanced for the identification of Samuel's children. In a revision of this article as originally written, any discussion of David Gentry has been moved to a separate article because the author now believes him to be a son of Nicholas Gentry rather than a son of Samuel, and Nathaniel has been added as a son of Samuel. The coverage of Samuel's children begins with Samuel's daughter, Ann, in this article. The remaining children will be described in the next succeeding Journal article. It will be recalled from previous articles in this Journal that Nicholas Gentry immigrated to New Kent County, Virginia some time before 1680, and established a home in the vicinity of Totopotomoy Creek, a tributary of the Pamunkey River. While the baptism of his youngest son, Nicholas-II was recorded in the St. Peter's Parish Register in 1697, the identity of his two older sons, Joseph-II, and Samuel-II (the suffix "-II" is being used as an indicator of the generation within the Gentry family descent) can only be inferred from contemporary records. Joseph is documented in (and only in) St. Paul's Parish Vestry records. Samuel's record is found in a variety of colonial Virginia documents. Nowhere is he specifically identified as a son of Nicholas-I, but the accumulated evidence is overwhelmingly in favor of this assertion. Surprisingly, he is not identified as such in Richard Gentry's compilation, "The Gentry in America" (GFA) and his name is only mentioned briefly in passing, although many of his descendants are included in a section entitled "Other Gentrys". This article is the first of series which will review in detail all the available documentary evidence relating to the sons of Nicholas the Immigrant. Rather than treat these in chronological order of age it will be more convenient to review Samuel and Nicholas first. The extremely limited information concerning Joseph will then be supplemented with what little is known about Gentrys of early Hanover and Louisa Counties, Virginia who are figurative "orphans" - not clearly identified in their relationship. Some of these were almost certainly descendants of Joseph, others were descendants of James Gentry, a younger brother of Joseph. The following then is a comprehensive review of all of the information that is known to this writer concerning Samuel and a discussion of the arguments for the identification of his children. Because of the length of the material covered, the article has been split into two halves and is being published in two separate installments. - Born about 1692, in the vicinity of Totopotomoy Creek, New Kent Co. (later Hanover Co.), Virginia. - Married about 1715 to Ann (maiden name unknown but may be Allen). Samuel died perhaps shortly after 1779, probably in Caswell Co. (later Person Co.), North Carolina at the home of his son Allen. His wife is known from two deeds in Louisa County, Virginia, in which she is named <5b,d>. Samuel's name is found in the St. Paul's vestry records for the first time in 1716<1a> at which time it appears he was living at the far western end of St. Paul's Parish in the vicinity of Stone Horse Creek. This was about 30 miles upstream from Totopotomoy Creek, as the crow flies, along the Pamunkey and South Anna Rivers, and probably half again that distance if traveling along the river. The 1716 reference for Samuel was one in which he was in charge of building a road. We can use this as a rough measure to estimate his age at the time--certainly he would be over twenty-one, and probably several years older than that in order to have this responsibility. This would place the latest year for his birth as 1695. We know that his sister Elizabeth was christened in 1689, and that their parents did not appear to have a large number of closely-spaced children. An approximate year of birth in 1692 seems reasonable for Samuel. Based on the limited information available, we can infer some of the details of Samuel's life from the time he left his father's home along Totopotomoy Creek until he moved away from Dirty Swamp in Louisa County. Samuel must have moved initially about 1715, probably shortly after marrying, wanting to establish a new home for his family. He was undoubtedly attracted by the availability of new land at the far end of the parish along Stone Horse Creek, which was essentially the limit of settlement at that time, The road from Stone Horse Creek to Stony Run to which reference is made in the parish records was presumably a new land route from the west end of the parish which would link up with established roads in lower St. Paul's Parish, and minimize the need for river travel from one end of the parish to the other. This is probably the same road mentioned in 1756 as one boundary of the precinct in which Samuel (and then later Nicholas-II) was located in 1716<1g>. What may be the same road, exists to this day as a country road that passes the upper ends of Stone Horse Creek and Beech Creek and then crosses Stony Run. Samuel's brother, Nicholas-II, also left his father's home and came to the Stone Horse Creek precinct to join Samuel sometime between 1716 and 1719 (when the latter's name is first mentioned in the parish records), at which time Nicholas would have been between 19 and 22 years old. Nicholas may have lived first with his brother, but by 1719 he apparently was living on land of his own (perhaps divided off from Samuel's), and had presumably married. Whereas Nicholas remained in that same precinct for some 15 or more years, Samuel obtained new land not far away at the mouth of Beech Creek in 1723 and 1724<2a,b>. Since he was not included in the processioning report for the original precinct when next it was filed in 1731, Samuel presumably either sold his first land, or probably turned it over to Nicholas. (Colonial land office grant documents have been preserved for Hanover County, but subsequent county deeds for the sale or purchase of those lands have all been lost.) The succeeding processioning reports which continued at intervals until 1743<1b-f> show Nicholas and Samuel living in separate precincts. This reflected Samuel's presence on his land along Beech Creek. (A major portion of this land lay on the north side of the South Anna River and became a part of St. Martin's Parish in 1726. As such, it would not be included in St. Paul's Parish records). A collateral piece of evidence shows the presence of a Gentry, undoubtedly Samuel, living on the east side of Beech Creek in 1734<2c>. One further reference to Samuel in Hanover County was in 1733 when he and his brother Nicholas served as surety for Mary Spradling who was appointed executor of the estate of her husband John Spradling<3>. This has been interpreted as suggesting that Mary was a sister of Samuel and Nicholas. 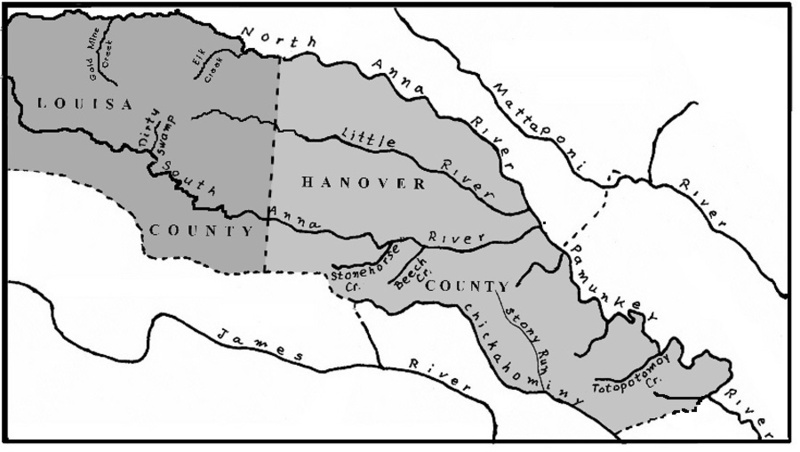 In 1742, Samuel was granted land upriver along the South Anna River on a creek by the name of Dirty Swamp in an area that became Louisa County<2d>. Samuel would necessarily have moved to his new property in order to consummate the grant by working the land. This was some 30 miles or so farther upstream along the South Anna River from where he previously lived. Louisa County was a brand-new county at that time, having been split off from Hanover County in 1742. Samuel's grant adjoined his brother Nicholas who had preceded him to Dirty Swamp in 1736. A portion of this land Samuel obtained from Richard Brooks Jr., the father-in-law of David and Nicholas-III Gentry. The remainder was new land, never before granted. A series of six deeds relating to the eventual disposition of this land are recorded in Samuel's name in Louisa County deed books during the period from 1747 to 1762<5a-f>. At the end of this time he had sold or given away all of his Louisa County land and followed his family (as well as the Richard Brooks family) to fresh settlements along the Meherrin River in Lunenburg County. In addition to the deeds, the only other Louisa County references to Samuel are two of a minor "housekeeping" nature in the records for Fredericksville Parish, the new parish which was established in Louisa County<4>. Samuel moved to Lunenburg County between 1753 (when he sold land to John Gilbert while still in Louisa County) and 1755 (when as a resident of Lunenburg County he served as an appraisor of Richard Brooks' estate in that county<6a>. Two deeds were recorded in Louisa County in 1757 and 1762 in which Samuel was identified as "of Lunenburg Co"<5e,f>. No references to him are found in the records of Cumberland Parish, which served Lunenburg County. The only reference to Samuel in addition to these three that places him in Lunenburg County, is found in an order of the County Court in which a Joseph Gentry, orphan son of John Gentry, was bound to Samuel in 1761<6b> (see discussion below concerning Samuel's children). However, there are many references throughout the Lunenburg records to Samuel's children beginning in 1748 and continuing to 1772. The lack of any deed references to Samuel after 1762 is surely a case of Samuel (now over seventy) living during that time of his life with one of his children rather than on land of his own. Two references for a Samuel Gentry in Caswell County, North Carolina<7>, suggest that Samuel spent the last years of his life with his son Allen, and died soon after 1779 in Caswell County, in an area that later became Person County. As for Samuel's wife, other than her name Ann, there is no information concerning her birth, her death, nor her family. Given the relatively large number of Allens among Samuel's descendants (beginning with one son and three grandsons), a name that is found among the descendants of Samuel and his brother David, but not of his other brothers, one can speculate that "Allen" came from Ann's family. If so, she was probably related to the David Allen, William Allen and "Runnel" [Reynolds?] Allen whose names are found along with Gentrys in Lunenburg and Halifax County records in Virginia, and in Johnston County records in North Carolina. We will begin with a listing of the names of the Gentrys whom we believe were children of Samuel. The justification for these choices will follow. All were born in what became Hanover Co. after 1720, probably in the vicinity of Stone Horse and Beech Creeks along the South Anna River. Ann born about 1728; married about 1750, Louisa County, to French Haggard. The older sons, and daughter Ann, are probably correct in their order of birth, and their dates of birth are probably reasonably correct. The order of the younger sons and their listed dates of birth are only rough approximations. [ In the original version of this article, [David] was included as a son of Samuel. We now believe he was a brother of Samuel rather than a son as discussed further below. Conversely we had thought Nathaniel was a son of David but we now believe him to be a son of Samuel.] It should be noted that only four of Samuel's sons are mentioned in "Gentry Family in America", and Samuel is not listed at all. The only one of Samuel's children identified specifically in contemporary documents was his daughter Ann, in a Louisa County deed dated 1750 in which Samuel gave 88 acres of his Dirty Swamp land grant to French Haggard, "for paternal affection to said French Haggard, my son-in-law"<5b>. This property was sold by "French Haggard & Ann his wife" in August 1757<8b>. The 1750 gift by Samuel was probably on the occasion of their marriage. In December of 1757, the same year they sold their Louisa County property, French and Ann purchased 100 acres of land on Flat Rock Creek in Lunenburg County adjoining David and Hezekiah Gentry<9a>. French appeared several times in subsequent Lunenburg County references. In 1762, they cut back on their property and sold half of it, then in 1772, French and Ann sold the remainder of their Lunenburg land<9b,c>. Their later movements are not known to this writer. The identification of Samuel's sons depends entirely upon interrelated evidence of varying degrees of persuasion. Before doing so, we can eliminate a number of potential names, especially the Gentrys named in the will of Nicholas-II who thereby are known to be a part of that family, and not a part of Samuel's. Less specific but just as valid, is the elimination of those Gentrys who lived in Hanover County in the period following Samuel's departure in 1742 who are all believed to be related in some way to Samuel and Nicholas' older brother Joseph or their younger brother, James. 1. David had a son Hezekiah as shown by his presence in Lunenburg County with David and his presence in South Carolina for well over fifty years with the other sons of David. 2. At the time of his death in 1824, a contemporary notation gave his age as "about 95", which means he was born about 1729. 3. There is no way we can rationalize his father, David, being a son of Samuel Gentry yet having a son of Hezekiah's age. Therefore we reason that he was a younger brother of Samuel, born about 1705 to 1709. There are other reasons to support this conclusion but we will not go into them at this time. The individual or individuals in question witnessed deeds for Samuel or for each other under circumstances suggesting a close relationship between the individuals concerned. The individuals were joint principals in the purchase or sale of land, or in court orders and actions. Because there is very strong evidence that all of Samuel's sons were at some time residents of Lunenburg County, is there any record of the proposed son in that county. Evidence of proposed sons having a continued close relationship to each other after leaving Lunenburg County, especially for those who settled in Surry County, North Carolina. No one of these various types of evidence is conclusive in itself, but taken together, they can provide a strong argument for the proposed relationship. During the period of time Samuel was living in Louisa County, there were few occasions for documents relating him to his children. The gift of land by Richard Brooks in 1743 to his son-in-law, Nicholas Gentry serves to identify the latter's wife. It also gives an estimate of the age of Nicholas, but does nothing to establish any relationship of Nicholas with Samuel. A more direct association of Samuel with his family can be found in a deed of sale by Samuel which was witnessed by his sons. In 1762, Samuel, "of Lunenburg Co." signed a deed witnessed by Joseph Gentry, Richard Gentry, and Simon Gentry<5f>. This has significance because neither Samuel nor any of the sons (except possibly Richard) were living in Louisa County at the time. The fact that the sons returned with Samuel to witness and participate in the land sale shows more than a casual relationship. An earlier deed, in 1757 in which Samuel Gentry "of Lunenburg Co." signed a deed in Louisa County witnessed by David Gentry<5e>, cannot be explained in this way. We have argued that Samuel and David were brothers rather than father and son. Perhaps we can rationalize this witnessing of a deed as being an occasion coinciding with French Haggard moving from Louisa to Lunenburg County, when David visited French in Louisa County to make plans for a joint purchase of land in Lunenburg County later that year. Samuel may have taken advantage of the situation to accomplish his own business transaction at the same time. The lack of deed references to Samuel's family in Louisa County is more than made up by the multitude of references in Lunenburg County where all of the family eventually moved. Nicholas, Joseph, Allen, Simon, Richard and Samuel's daughter Ann are repeatedly documented in County records with joint deeds of sale, witnessing for each other, appearing in court as defendants or plaintiffs in joint suits, and living in adjacent areas. These Lunenburg references will be discussed later in brief individual summaries of each of Samuel's children. Samuel's son, Simon, was the first to leave Lunenburg County, moving back north to Cumberland County, Virginia, where he was married in 1760. The next to leave was probably William. The rest of the family lived in Lunenburg for another ten or so years, then all left within a very short period of time. We can assume that raising tobacco on their farms in Lunenburg had exhausted the soil. When Surry County, North Carolina, was formed in 1769, much new land became available and was very attractive as a possible new home. Samuel's son, Allen, appeared briefly in Surry County, then settled along with his father on the border between Halifax County, Virginia, and Caswell County, North Carolina. All the rest of Samuel's sons, Nicholas, Joseph, Richard, Samuel Jr. and Nathaniel went directly from Lunenburg County to live in Surry County or South Carolina. They were joined there later by two of Allen's children (Meshack and Abednego). Their presence there as a group and their previous presence in Lunenburg County are strong arguments for all being a single family unit. In the second half of this pair of articles we will be briefly summarizing in turn, each of the Gentry sons we have identified above. Because of the large part Lunenburg County played in their life, a little background information on that county will be helpful. Lunenburg County was formed in 1746 from Brunswick County, and many of the grants of land there date from just a few years before that time. It was virgin territory at the time the Gentrys moved in compared to the areas of central Virginia that had been settled in a stepwise fashion, working upstream along the York and Pamunkey rivers. 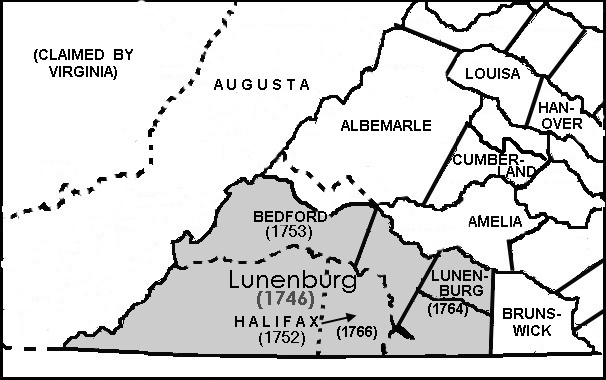 Lunenburg initially encompassed ten counties that were eventually organized as separate entities, and is shown by the shaded area in the map shown in Figure 2 below. Halifax County was initially separated as a very large county in 1752, then reduced to its final size in 1766. Bedford County was formed in 1753 and was accompanied by an adjustment of the northern boundary of the original Lunenburg County. Lunenburg attained its present size in 1764 when Mecklenburg County to the south, and Charlotte County to the west, were separated from it. The various Gentry families lived in the residual area of Lunenburg County which was the territory most accessible when the county was formed from neighboring Brunswick County. It is interesting that all of Samuel's family moved into this small geographical area, and then every one of them had left within 25 years. The most obvious explanation is that the land had played out in that length of time, and it was not worth staying in the neighborhood. The county today still has the forlorn appearance of an abandoned ghost county, the county courthouse in the town of Lunenburg (which is on the National Register of Historic Places) stands in lonely isolation in the midst of a small rural settlement. Perhaps one of the claims to fame for the courthouse is that it has not been burned or destroyed by passing army forces, thus leaving largely intact its store of county records. 1. "The Vestry Book of St. Paul's Parish, Hanover County, Va, 1706-1786", transcribed & edited by C. G. Chamberlayne, published by The Library Board [of Virginia], Richmond, 1940, reprinted 1973. "In Obedience to the [Order of new Kent County Court] its Ordered that all the Tithables from Golden mine Creek, to Stony run with Mr. Geo. Dabney's Quarter, and Thomas Harris, do assist Sam'l Gentry in Clearing a road, from Stone Horse Creek to Stony Run." (b) 1719 "8br" [Dec] 10 p.265 : Processioning return. [Precinct 31]: "The lands of ... Nich'o Gentry, ... Sam'l Gentry, of which Mr. Geo. Alves & Nich'o Gentry were Overs'rs; who made this return, the within Order comply'd with ... [signed] Geo. Alves, Nich'o Gentry." (c) 1731 Oct 29 p.273 : Vestry meeting. [Precinct 3]: "Orderd into one precinct for processioning the lands of ... Sam'l Gentry, ...; Michael Holland and Sam'l Gentry to see the same procession'g performd etc. ... [signed] Michael Holland, Sam'l Gentry. (d) 1735 Oct 18 p.143 : Vestry meeting. "Ordered that Sam'l Gentry have the Tithables of ... Nich'o Gentry, ..., to Assist him in Clearing the road, whereof he is Surveyor." (e) 1739 Sep 11 p.296 : Vestry meeting, lands divided for processioning. (f) 1743 Nov 18 p.306 : Vestry meeting, lands divided for processioning. 2. "Cavaliers and Pioneers, Abstracts of Virginia Land Patents and Grants"
"Samuel Gentry, 400 acs (new land) Hanover Co., on N. side the South Anna (Riv), bet. lines of Drumond, Scott & Taylor". "Samuel Gentry, 196 acs (new land) Hanover Co., on both sides of Beech Cr. ; adj. Mr. Alves cor; William Harris' line; & line of Drummond & Scott". "Buckley Kimbrough of Hanover Co., (new land in sd. Co.) on North Fork of Stagg Cr., adj. Drummond, Hudson, Lacey, Holland & Gentry". [N. fork of Stagg Cr. lies within 1/2 to 1 mile east of Beech Cr., indicating this reference must be to Samuel Gentry's land]. "Samuel Gentry, 700 acs. Hanover Co. on both sides of dirty Sw; adj Clark, Henson & Brooks. 108 acs part formerly gtd Richard Brooks by Pat. 5 [sic] Aug 1731 (Patent Bk 14, p.219, 400 acs to Richard Brooks Junr. dated 15 Aug 1732 [sic]) & by him sold and conveyed unto the sd. Samuel Gentry. The Residue never before gtd." 3. Rosalie Edith Davis, "Hanover County, Virginia, Court Records 1733 - 1735: Deeds, Wills and Inventories"
Nicholas and Samuel Gentry post £100 bond with Mary Spradlin [Spradling], administrator of the estate of John Spradlin. At a Vestry held for Fredericksville Parish...the accounts from 1749 through Aug 1752 records Samuel Gentry was paid 15 pounds. Samuel Gentry and Nicholas Gentry to Richard Walker, for 30 pounds, sold 125 acres, being part of 400 acres granted 28 Dec 1736 to Nicholas Gentry and the residue being 110 acres, being part of 700 acres granted 30 Jul 1742 to Samuel Gentry on both sides of Dirty Swamp, adj. to Samuel Gentry and Mathew Jouette's line. Witnessed: Danl. Burford, Junr., William Rice, Richard Haggard. Wit: James Tate, Waddy Thomson. 24 Oct 1752; ack by Samuel Gentry. Signed: Samuel (S) Gentry. Wit: Charles Cosby Junr., David (D) Gentry. 22 Nov 1757 ack. by Samuel Gentry. Wit: Joseph (X) Gentry, Richard Gentry, Simon Gentry, Richard Hargard [Haggard]. Signed: Samuel (S) Gentry...; Proved 10 Aug 1762 Richard Gentrey [Gentry] & Simon Gentrey [Gentry]. Ordered that John Williams, Samuel Gentry & Drury Moore appraise the slaves & personal estate of Richard Brooks decd, and return the appraisement to the next court. 1777 Allen Gentry and Shadrick Gentry (assessed for land), and Samuel Gentry (no land tax but liable for poll tax). 1779 Oct 26-30 Samuel Gentry and Obednego Gentry sign petition for division of Caswell County [Obednego (or Abednego) being a son of Allen Gentry]. Petition of inhabitants of Surry Co. concerning land entries. Signatures include Samuel Gentrey, Auther Gentrey, Saml Jentery. William Embry of Lunenburg Co VA to French Haggard, for 20 pounds, sold 100 acres on upper side of Flat Rock Creek, being part of a grant of 5 Sep 1749 to Richard Talliferro and conveyed to Embry in General Court. Signed: Wm Embry. Recorded Dec 1757 Court. French Haggard to Thomas Ayre for 40 pounds, sold 50 acres, granted 5 Sep 1749 to Richard Taliaferro on south side of Flat Rock Creek of Meherren. Wit: Ruben Vaughn, Allen (A) Gentry, John Hight. Signed: French Haggard, and Ann (A) Haggard. Recorded 5 Oct 1762. French Haggard of Lunenburg Co. to Roger Atkinson, merchant of Dinwiddie Co., for 45 lbs sells 50 ac in Lunenburg Co. bounded by Flatt Creek to the east ..., which land Haggard purchased of William Embry. Signed and ack. by French Haggard [no mark]. Wit: David Garland, Wm Taylor, Nicholas Murray.